Ophidia: is a research project on big data analytics for eScience. It provides a framework for parallel I/O and data analysis, an array-based storage model and a hierarchical storage organization to partition and distribute multidimensional scientific datasets. B2DROP and B2SHARE: are EUDAT services that provide a flexible and open data sharing. ECAS users will be able to access/share data and notebooks. EOSCHUB AAI: besides LDAP, B2ACCESS, EGI Check in and Indigo IAM can be used to login to the ECASLab. ESGF: provides a robust software stack covering different areas. 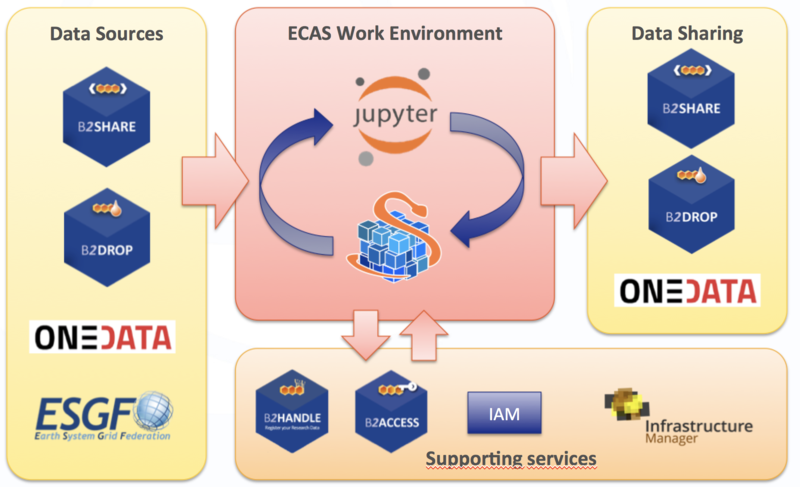 The most significant for ECAS is Data node. Actually, CMIP5 and soon CMIP6 data are available from ESGF data pool at CMCC and DKRZ.